Clock Repair Service repairs and services cuckoo clocks of all makes and models. Many cuckoo clocks were purchased from our soldiers stationed in Germany during the war and after. Most of these clocks were good quality cuckoo clocks. Many had hand made and hand painted cases with wonderful German movements in them. Unfortunately, cuckoo clocks are one of the harder clocks to repair and service and many clock shops did not service cuckoo clocks and many of the cuckoo clocks brought back to the states were never service or even oiled. Cuckoo clocks, as well as all clocks, need to be oiled every 2-3 years and also require a good cleaning every 7-10 years. The fact that many were not properly oiled and cleaned, a lot of the cuckoo clocks simply do not work. The oil and dirt combination has worn many of the movements out to the point of them needing to be repaired or rebuilt. Our repair shop receives many cuckoo clocks each month both as walk in customers to our shop as well as customers mailing in their cuckoo clocks to our shop. We have great success on repairing cuckoo clocks. Fortunately we are still able to purchase original parts from German manufacturers of cuckoo clocks. We have listed below several pictures and instructions to help you troubleshoot your cuckoo clocks problem if you care to. Sometimes its just a matter of a small adjustment that will get the cuckoo clock up and running. We understand that there are few clock repair shops around anymore and the few that are do not work on cuckoo clocks at all, that is why we have set up this page. If you are unable to get your cuckoo clock up and running, we will be happy to have you bring your cuckoo clock into our shop or if you are out of our area, we provide a "mail in " service for cuckoo clocks to be sent to us for the repairs. Please call us @ 678-462-7856 if you would like to mail your cuckoo clock into our shop, of you can click here to get further instructions. Listed below you will find some helpful hints and some detailed information on servicing a cuckoo clock. Please keep in mind that, although not all cuckoo clocks are the same their functions and the function of a movement are basically the same. First check if all the pieces are there. If the clock only has a cuckoo bird and the time, it only uses two weights. If the clock has a music box or dancers on the top front, usually the clock would take three weights (with some exceptions). There is one weight that runs the time, one weight that controls the cuckoo and the bird action and the last weight controls the music and/or dancers. It is simple to look at the chains hanging from the clock to determine the quantity of weights the clock takes, then see if all the weights are with the Cuckoo Clocks. Also see if it has its pendulum, and the back (which has the gong coil attached), its head dressing and lastly see if the hands are on the clock or broken off. The back of the Cuckoo Clocks is only needed if you choose to hear the gong after the cuckoo call, and the head dressing is only a decoration for the top of the clock. One of the reasons a Cuckoo clock stops working is that the mechanical movement of the cuckoo clock is not level. This generally happens when the cuckoo clock is not hung level or straight on the wall. The mechanical movement cuckoo clock is driven by the sway of a pendulum, often decorated with a had carved maple leaf. Start by listening to the back and forth swing of the pendulum. This tick-tock sound is often referred to as the cuckoo clock heart beat. The pendulum should swing to the right for the same amount of time that it takes for it to swing to the left, one second for every back-and-forth movement. If the heart beat is irregular, adjust the cuckoo clock’s position on the wall until the tick-tock beat of the pendulum sounds even again. Sometimes the cuckoo clock itself may not be strait and level on the wall, but you are getting a smooth tick-tock then there is an adjustment that needs to be made on the pendulum leader. This is the wire that the pendulum hangs on. There is a door latch or lock on the door for the cuckoo bird to come out. This latch is used for shipping purposes and sometimes will loosen up and drop down to lock the door. Check to see if this latch is holding the door closed. If it is, simply unlatch the door and the cuckoo bird is freed to come out now. There is also on some models, an on off switch. 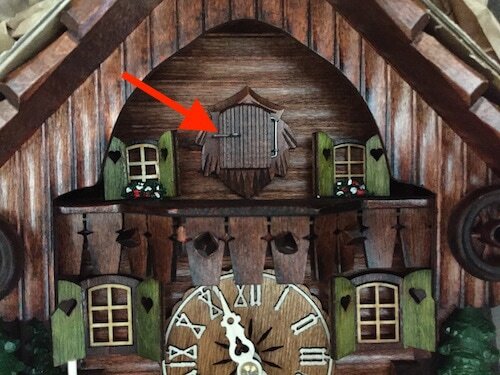 Some on off switches are located on the side of the cuckoo clock and some are located on the bottom side of the cuckoo clock. Look to see if your cuckoo clock has one of these switches. Many of the cuckoo clocks that have one of these switches will have a sticker near it to indicate what is on and what is off. If you have tried both of these procedures and the cuckoo clock still will not cuckoo, there are several other items that will to be looked at and most of them will require a professional clock shop to look at the reason behind the problem. Many times, your cuckoo clock will cuckoo the wrong hour. Lets say It may be 12 o'clock, however the bird only cuckoo's 6 times. In this example you would move the "hour Hand" to the number of cuckoo's or chimes, in this case you would turn the "hour Hand " to the number 6. The hour hand is just press fit on a tapered barrel and can be turned ether clockwise or counter clockwise. Many times after moving the "hour hand" it may feel loose. If this happens, you can simply press the base of the hour hand down using your 2 thumb nails equally until the hour hand on the cuckoo clock is tight again. Be careful here and DO NOT press the hour hand down to far. If the hour hand touches the cuckoo clocks face the cuckoo clock will stop running. The hour hand just needs to be off the face and not touching anything.